My Comments/Opinions/Descriptions of Some Oahu Surf Breaks. (sorry if you clicked here, I'm still working on this page -gone surfing, 6.12.98). Lighthouse is east of Waikiki and is often surfable when no place else is. if there's tradewinds blowin, you can probably get a waist high wave here when everyplace else is completely flat. might have to duck a flying windsurfer from the spot next door (cliffs), though. south, east swells mostly, but sometimes a big west will wrap. usually has more manageable crowd situations, but like most south shore spots, it doesn't have juice like the north shore. example of a three footer; soft takeoff then a very workable shoulder, then depending on the tide, either closes out on the inside (especially if it's overhead) or rideable until you see exposed reef. in my experience, can be good up to 5'...you'll be at other, better spots if it's bigger than that. 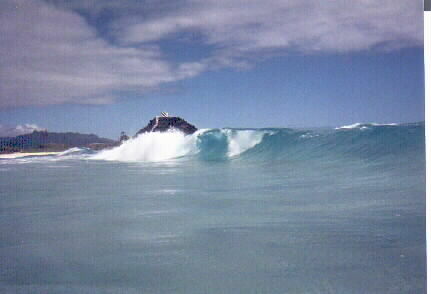 Kaneohe Marine Corps Air Station is on the east coast of Oahu, usually blown out but a blast to surf if you know what to look for, the wind whips up some excellent pockets & bowls, then you can usually get in a few more turns before the thing dumps onto the sandbar. shallow sandbar, the kind that you scoop sand when you dip and half the time it's easier to walk than paddle. certain waves often double up, pitch, and can get you a dry barrel or bury your head in the sand. the break can get unbelievable with an east swell and Kona (south) winds. it is very similar to the Ehukai stretch of beach breaks, without the crowd (need military vehicle decals to enter base). sand bottom makes for quick changing wave conditions. and is notorious for man-o-war infestation (i had one down the front of a tank top wetsuit once). usually lots of seaweed in the lineup & impact zone. surfable (in my experience) from knee high to maybe double-o. Barbers Point Naval Air Station this break (White Plains) on the west side is a sand bottom windslop mushburger, not to be confused with other semi-secret juicy spots in the area. will be fun on a south swell or west swell mostly, but will catch a big northwest. usually looks like chaos from the shore, won't get much bigger than head high... waves feel bottom on the outer reefs/sandbars...break, then die off several times before it becomes surfable on the inside (& loses almost all power). loads of fun for foolin around or beginners. sometimes a wave will double up & let you push it off the bottom for a decent lip bash. murky water, history of shark scares.